Diagonal cracking is an inclined crack beginning at the tension surface of a concrete member. 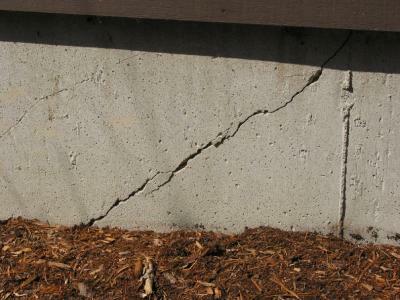 Steep diagonal cracks appear in concrete foundation due to point loads that exceed the compressive strength of the concrete. This type of failure, known as settlement, can happen due to “volume changes in clay soils due to fluctuation in their water content, increased pressure on a portion of the foundation, or long term consolidation of compressible clay under the foundation” . If the soil under the footing cannot stand the compression force from the weight of the foundation and house/building, then the structure will sink and any adjacent walls that are adequately supported will resist this movement. In addition to diagonal cracking caused by external effects, it can also occur from internal problems. 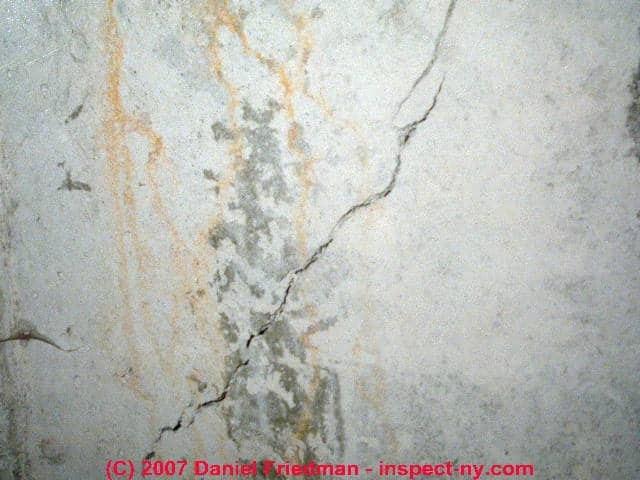 Diagonal shrinkage cracks can occur in a concrete wall due to “improper mix or improper curing at the time the concrete was set in place” . It is important to make sure that there is adequate soil to place the foundation/structure, and that the mix and curing of concrete was done properly. Concrete walls tend to display vertical cracks but settlement or frost heaving at a corner of a concrete wall can produce diagonal cracks or breaks in that location. Steep diagonal cracks may also appear in concrete foundations due to unusual point loads that exceed the compressive strength of the concrete (maybe it was weak concrete not high loading), and we’ve seen steep diagonal cracks in poured concrete and other high-rise masonry buildings exposed to frost damage. : But in this photograph of a diagonal crack in a poured concrete foundation, we are almost certainly looking at a large shrinkage crack. Notice that discontinuity in the crack pattern? 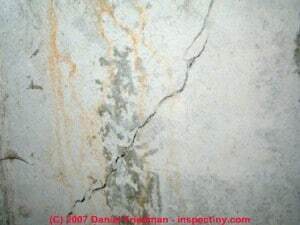 Diagonal cracks which emanate from the corners or windows, openings, or other changes in the shape of a wall (or slab) are called reentrant cracks and are a form of shrinkage crack. Temperature and shrinkage cracks in foundations may appear within days to several years after the home is occupied. Vertical movement in a concrete block or brick wall might appear as either vertical cracks but more often as step cracks in which the crack pattern follows the mortar joints between the masonry units in a stair stepping pattern. 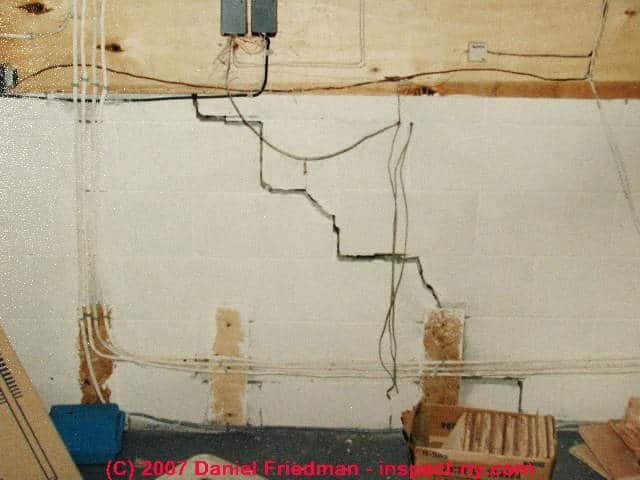 In this photograph, major vertical dislocation, foundation settlement, has caused large step-cracking in the concrete block foundation wall. In addition to diagnosing and correcting the reason for this settlement or foundation movement, this section of wall will probably have to be rebuilt. Where step cracks are present, if you draw an imaginary line at right angles (orthogonal) to the diagonal formed by the stairstepped cracking, the downwards direction of the line will generally point to the center of the point of downwards (or up and down) movement in the structure. But unfortunately even this “rule” has exceptions. In Florida we observed a concrete block home with step cracking high in some of its walls. The cracks were traced to settlement at the other end of the building which was responding to soil subsidence over a sinkhole.